It’s been far too long since I last posted some of my grandfather’s photographs of his service in the United States’ draft army and the time he spent in Manila, Philippines during the interim between World War II and the Korean War. In honor of Veteran’s Day today, I think it’s time to get back to sharing more of the wonderful historical photographs that my pap took during his travels. He was fortunate enough not to have to serve during war, but he still witnessed its horrific aftermath. 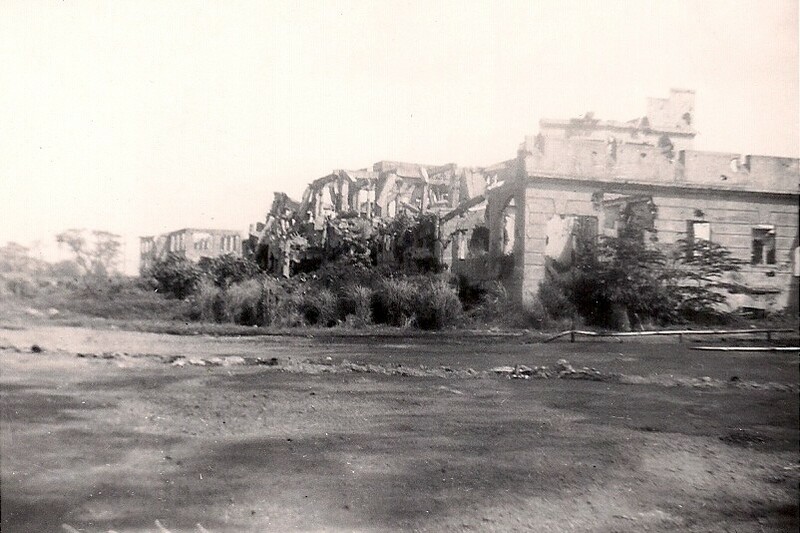 It’s amazing and heartbreaking how much damage and loss you can still see in these pictures more than a year after the city was destroyed in the month-long Battle of Manila (February 3 – March 3, 1945), the climax of Japan’s three-year military occupation of the Philippines during World War II. If you’d like to find out how my pap ended up in the Philippines in the first place, I suggest first reading the biography I’ve written about my pap (Thomas Alexander Piotrowski, Sr.) and then checking out the photographs that I’ve previously posted by searching under the “maternal grandfather” tag or by clicking here before continuing with more recent posts. Moving on, here we have yet another photograph from the city of Manila which shows the utter destruction that happened to the city when American forces came to liberate the country during World War II. Japan attacked the Philippines the same day they bombed Pearl Harbor – December 7, 1941 – and took over Manila almost a month later. I’ve touched upon the Battle of Manila in previous posts. Many people were interned and massacred and many of the city’s cultural, governmental and civic buildings were decimated by bombing and shellfire. Part of the reason why it’s taken me so long to get back to this genealogical project is I am not 100% sure of the identify of this building. The ruins below could be of what’s referred to as the New Manila Police Station or they could possibly be of the Hike Shoe Factory. What I do know, according to some of the online research I’ve done and some information from a source, is that both buildings were located at opposite corners at the intersection of Isaac Peral Street (now United Nations Avenue) and San Marcelino Street. During the Battle of Manila, both the new police station and the three-story shoe factory along with other nearby buildings (i.e. the Manila Club, Santa Teresita College and San Pablo Church), were part of a Japanese stronghold in that section of the the city, with the police station as the focal point of the resistance. 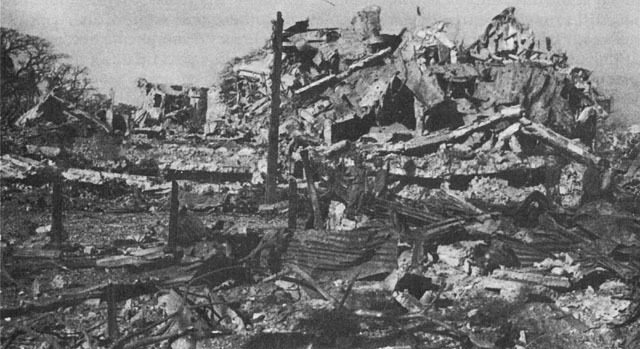 The American forces (1st Battalion of the 129th Infantry) eventually accessed the building, demolished it with artillery and tank fire and assumed control of the ruins. It took about eight full days to clear the Japanese from these buildings. The Hike Shoe Factory was also destroyed in this battle. Apparently the “hike shoe” was a type of shoe worn by soldiers in the United States Navy, I’m assuming this was a type of high grade, modern hiking boot. Apparently it was made by the United States Shoe Co. that had a factory in Manila. So which building is it? Was this the new police station after it was destroyed in the Battle of Manila? My reliable source John Tewell has identified this building as such. However, another picture of what’s also supposedly the new police station doesn’t resemble the building my pap captured on film. According to Wikipedia, the Manila Police Department transferred their headquarters in 1949 into a new building constructed using money from the Philippine Rehabilitation Act of 1948, so was this building instead the destroyed shoe factory before being rebuilt for the new and current police headquarters? There appears to be another building in the background – is the the Manila Club? If so, that would suggest this is the shoe factory as the club was reportedly located just north of the factory. I have seen maps that place the police station at both the northwest and northeast corners of the intersection. I have so many questions! If anybody can help me definitively identify this building and at which corner of the intersection it sits, I would very much appreciate it! Next postSeeking Stories & Photos for New Idlewild Park Book!